The Washington State Department of Ecology (DOE) National Pollution Discharge Elimination System (NPDES) Stormwater Permit issued to the City of Poulsbo requires the City to adopt the 2012 Stormwater Management Manual for Western Washington (as amended in December 2014) and amend appropriate sections of the Poulsbo Municipal Code to require Low Impact Development principles and best management practices to be the preferred and commonly-used approach to site development. The adoption of the 2014 Manual and amendments to the PMC regarding LID must be completed by December 31, 2016. The 2014 Manual represents a shift in the development process which puts an emphasis on protecting areas which are well suited to handling stormwater. The 2014 Manual requires that all projects shall complete LID feasibility analysis and implement LID best management practices to the extent feasible. The primary LID principles and BMPs to be incorporated are: (1) Measures to minimize impervious surfaces; (2) Measures to minimize loss of native vegetation; and (3) Other measures to minimize stormwater runoff. Conventional stormwater management has led to large storm facilities in one location; the 2014 Manual will result in more numerous but smaller facilities which may look more natural. Installation of rain gardens on individual lots, bioretention areas near parking lot islands, pervious driveways, and infiltration areas will take precedence over the use of conventional systems. The purpose of the code updates is to remove barriers to LID implementation within City codes and standards. Some LID features and facilities are not supported by staff, for example pervious public roadways, due to a number of reasons including maintenance and safety issues. Six municipal code sections and portions of the City construction standards were identified as part of the LID code review process. In general these amendments and revisions serve to allow LID and clarify where and what type of facility is acceptable. 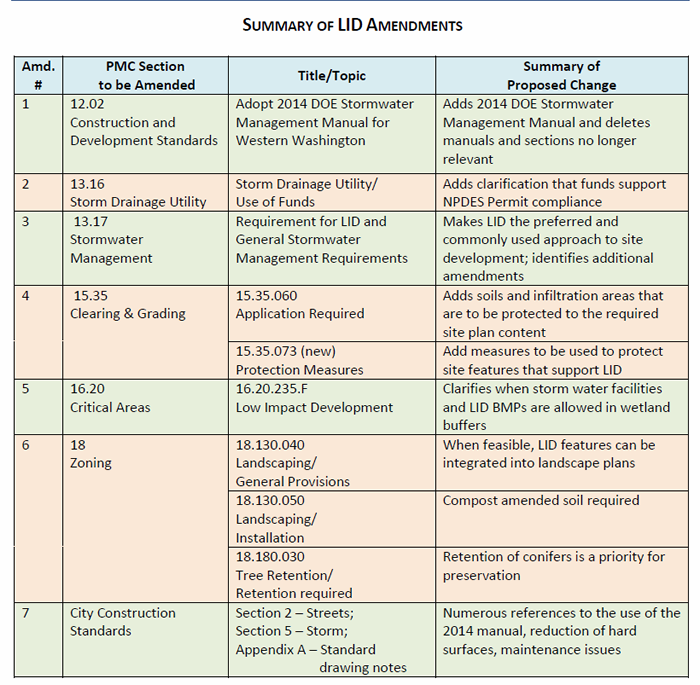 In addition, some non-LID stormwater code revisions to PMC 13.16 and 13.17 are included which provide clarifications, procedural revisions, and compatibility with the current NPDES Permit. A summary of all amendments is in the following table. The full package should be reviewed for specific revision and amendment language. To provide the public with timely information, an understanding of the process, and opportunities to review and comment on the 2016 NPDES Permit Code Amendment, and to have these comments forwarded to the City’s decision makers. Ensure that information about the process is provided to the public early in the process and at regular intervals thereafter, to maximize public awareness and participation in the process. Actively solicit information from citizens, property owners and stakeholders about their concerns, questions and priorities for the process and code section. Encourage the public to informally review and comment on the update throughout the process. Incorporate public comments into the local government’s review process prior to significant milestones or decision making. Provide forums for formal public input at milestones prior to decision making by local officials. Consult and consider recommendations from neighboring jurisdictions, federal and state agencies, and Native American tribes. The draft amendment package and code sections are available for public review. The primary clearinghouse for information related to the update is the city website – www.cityofpoulsbo.com – at the Engineering main page. Meeting dates, official notices, updates on the process, notice of application and environmental review, public hearing notices, and decisions will be posted. Documents will also be available for review at Poulsbo City Hall 200 NE Moe Street, Poulsbo. Copies will be provided at a reasonable cost. Official notices will be published in the North Kitsap Herald and posted in the Poulsbo Post Office, Poulsbo Library and Poulsbo City Hall notice board. The local news media will be notified of the amendments. A mailing list of interested persons and organizations to receive notices regarding meetings will be maintained. Notice will be provided either by email. Individuals interested in being on the mailing list should contact planning&econ@cityofpoulsbo.com. Comments may be provided at any time during the process. Written comments will be taken by the City and forwarded to the recommending and decision making bodies as part of the record. 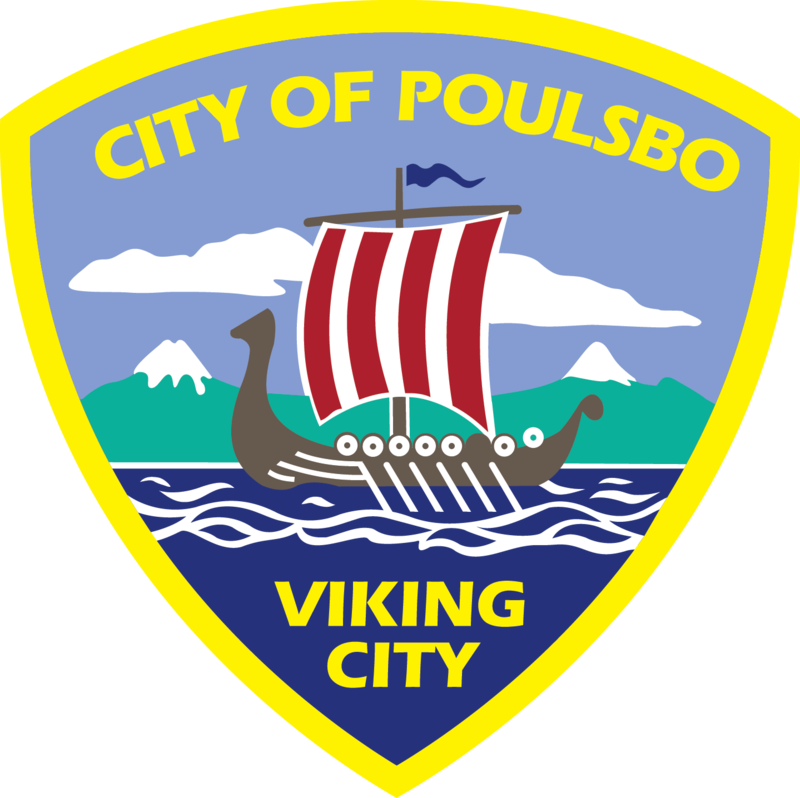 Send written comments to City of Poulsbo Engineering Department, 200 NE Moe Street, Poulsbo, Washington 98370, or fax them to (360) 697-8269. In addition to receiving comments through regular postal mailing and fax comments may be sent to engineeringdept@cityofpoulsbo.com. To ensure consideration, all written comments must be received by the City prior to the close of the City Council public hearing. Verbal public comments will be taken at Planning Commission and City Council Public Hearings for these who wish to address the recommending and decision-making bodies in person. All meetings and Public Hearings will be held in the Council Chambers at 7pm at City Hall, 200 Moe Street, Poulsbo, WA. The Planning Commission and City Council will conduct at least one public hearing each to gather and consider public testimony on the 2016 NPDES Permit Code Amendment. The hearing(s) are anticipated for October 25, 2016 and December 7, 2016 (see above for anticipated timeline). Public notice of hearings will state explicitly the date/time, review and location of the public hearing. The public notices will be published in the North Kitsap Herald, posted at the City’s public notice locations, and sent to the mailing list. All public meetings and hearings will be audio recorded. Minutes and/or meeting summary for all public meetings will be prepared, and hard copies made available upon request.